Isn’t the picture beautiful? My lovely friend Eileen Wharton got them for me – I was having a particularly bad pain day – I don’t know how to describe it other than that. Some days are better – there’s always pain at the minute but some days it’s bearable and I don’t need many pain killers. Other days it’s like I’ve been hit by a train – my joints are stiff and swollen, hot to the touch and sore. This day was very bad – worst I’ve had in fact. I couldn’t bend my fingers, my wrists ached, my shoulders wouldn’t rotate without immense pain, I could barely walk as my knee and ankles/feet were also really sore. 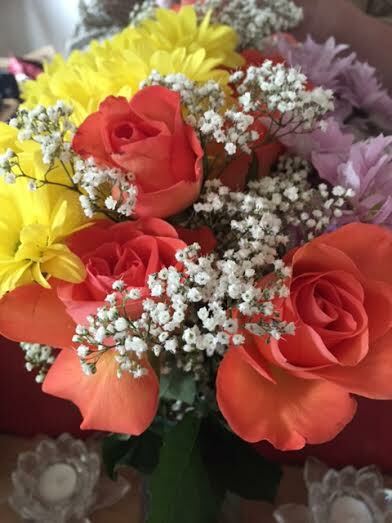 So Eileen came through to mine and brought me lovely flowers to cheer me up – which I needed trust me! I’ve been reading a lot of articles and what not about Rheumatoid Arthritis lately – it’s not a nice thing to have. Not that any disease is obviously. I don’t even know if I have that yet – that’s a presumption based on what the consultant said at my appointment. I had more bloods taken, xrays done of my hands and feet and have to go for an ultrasound on my hands and feet so he can see what’s happening with the soft tissue surrounding the joints. Until my next rheumy appointment though, it’s just painkillers. Which didn’t touch me that day. A friend who suffers described the pain very well – it’s like a permanent toothache in your joints then suddenly something cold hits the nerve and stays for a few days. I’m still struggling writing as it hurts to type – this blog is actually the first writing I’ve done in about 2 weeks, not to say that I’m not thinking about it mind you. If anything it’s the thinking that takes up the most time for a writer! I have been doing some research, looking up points to include in my next murder scene, and also thinking ahead to which characters I want to use in book 5, which already has a basic plot outline. It’s going to be a busy few months – I’ve got the lovely Jo Rodgrigues working on my cover for the short story I’m releasing later this year, and the short story is currently with my wonderful editor Jenny Drewery. It’ll be so exciting getting it prepped and ready for release in October/November this year as a lead in to the first novel – I know I mentioned it last blog, but my release will be in March 2016 – just so you all don’t forget!! I’ve been contemplating getting the Dragon software which allows conversion of voice to text. Will see what happens with that. I’ve also been dreaming about writing of late – odd dreams that sometimes match my novels or are like watching a plot unfold before me – I do wake and remember them so very often I quickly scribble them down on the notebook feature of my iphone – they don’t often make a lot of sense but they do provide a good insight into the dreamworld and may be used in future novels! I’ve also acquired a new app – which amazingly is free to download from itunes. It’s called moleskine – and you’ve guessed it – it’s a notebook app! That looks like my treasured moleskine notebooks! So impressed with this am I, that I decided I’ll keep a diary documenting my disease journey. It’ll probably never see the light of day, but it’s been really helpful for me both understanding what can set off the pain, and also helping me with the therapy that only journals provide. This entry was posted in Blog Posts and tagged author, blogger, crime writer, crime writing, Networking, social media, writer, writing on June 28, 2015 by Kerryrichardson77.